Riding Michaux - Page 3 - DAMN Riders - No rules, Just ride! Or Ken strapped to the back of WF's Twin. I have a bike that I need to shake down before dragging down to Alabama if there's another one of these coming up in the next few weeks. I still have to get it inspected, and the replacement clutch lever is on slow shipping. Weather permitting I'll try to set something up for later March/ early April. I'd be in for a March/April ride or two. I'm itchin' to get out and get this new WRR dirty. I saw were the trails up in the Seven Mountains area aren't open until the weekend before Memorial Day this year. The trails in Michaux are open all the time? Yeah, total bs. Michaux only allows bikes on forest roads, which are all gravel. Occasionally you can find some open gates and hit some not so well traveled roads. Good ds stuff. 7 mtns has a nice ds trail system. It opens Memorial day. As does Shade mtn. 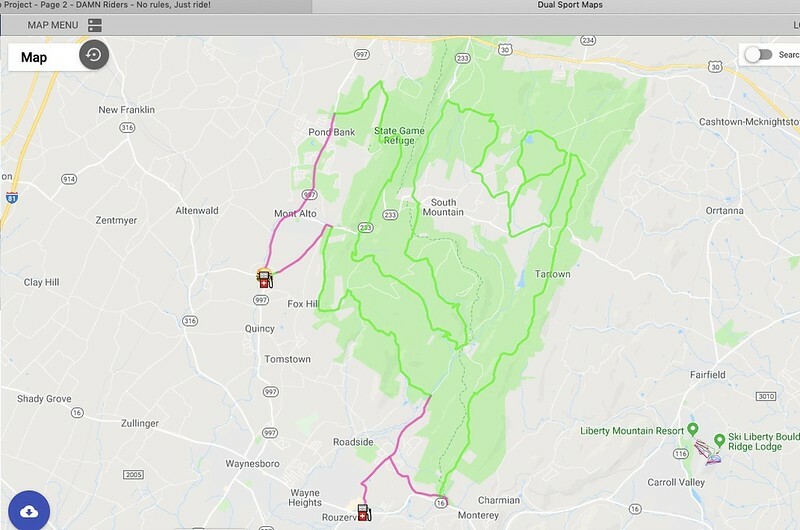 I came across this dual sport map of Michaux. Is this a map of just the dirt roads and not the ATV trails?